In order to begin construction on this 58 unit, four-story seniors independent living facility, extensive sitework of the existing hillside had to be completed, including regrading tons of earth, creating retention ponds, and designing rain gardens. With the hillside successfully managed, construction on the wood-framed building was completed on a fast schedule, all while maintaining careful attention to the many sustainable systems and features that make Plum a one-of-a-kind retirement residence. 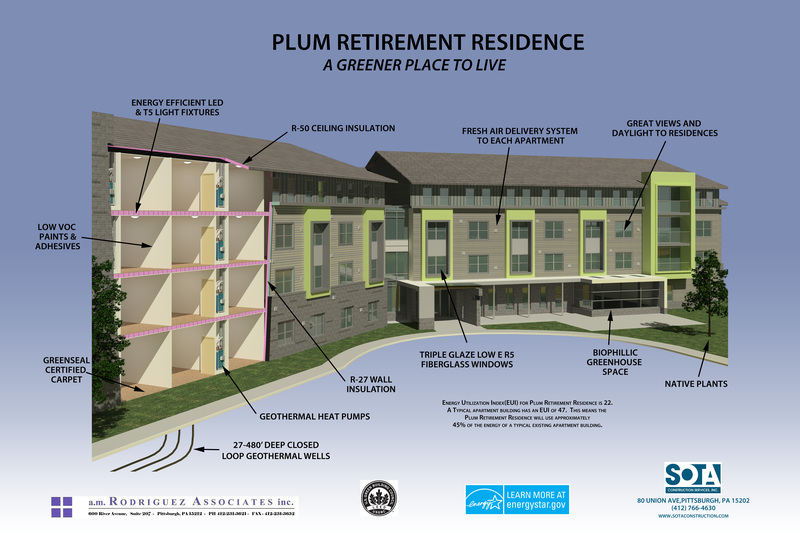 The cutaway diagram of this building illustrates much of what sets Plum Retirement Residence apart from other senior residences, including an ulta-tight builidng envelope, high-efficiency windows and HVAC equipment, low VOC paints and adhesives, a fresh air delivery system to each apartment, and air-to-air heat exchangers--all of which offer the highest quality, most healthful indoor environment for its residents. One of the most exciting features at Plum is the geothermal well system--a closed loop network of 27 wells running 480 feet deep underground--that helped the building earn its LEED Silver ceritifcation. Other amenities offered to residents include a roof deck, greenhouse, library, lounge, exercise area, wellness center, central kitchen where optional meals are prepared, and a multipurpose room for dining and assemblies.